Including extra lenses for an optical zoom on a smartphone is impractical because they take up additional space. Most smartphones only offer a digital zoom or two different lenses side-by-side, like the recent models of the iPhone. First spotted by Patently Mobile, Samsung’s patent shows an electronic pen with four optical lenses stacked inside the top of its housing, but the application leaves room for the number of lenses to vary. Using the extra space in the stylus opens up an opportunity to include a wider range of optical zoom options. Giving users a higher-quality zoom on Samsung devices seems great on its own, but the bigger implication is that the stylus could take over the duties of the selfie-cam. The patent mentions that the “optical system may further include an optical path conversion unit” that could be made with a prism or a mirror. In other words, the stylus could work like a periscope. An included diagram illustrates the pen sitting in a Galaxy Note-style holding storage space as well as peeking out slightly like those pop-up cam systems we’ve seen recently. The potential for the stylus to remove the front-facing camera means that Samsung could use it to avoid notches or punch holes altogether and release an all-screen smartphone. With the Galaxy Note 9, the S-Pen included Bluetooth functionality that let you remotely control the camera, adjust app functions, change slides in a presentation, and other useful features. It added a little extra value to the stylus for people who aren’t particularly attached to the idea of scribbling hand-written notes. Including a camera in the stylus and producing a phone with a beautifully seamless screen could be an extra selling point. You could also imagine the camera being attractive to obsessive note-takers who want to quickly snap a photograph of a presentation while they’re writing on their device, especially if image-to-text conversion is incorporated. And if the camera is good enough, imagine how stable your videos could be when you’re holding a pen that only weighs an ounce or two. If this concept ever became reality, two possible downsides include the fact that such a stylus would likely be much more expensive than the S-Pen and the battery life wouldn’t be so great. 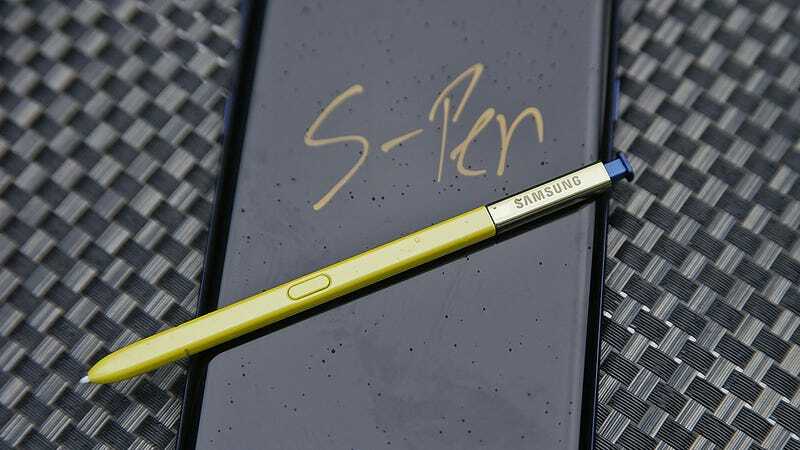 The battery in the current S-Pen can last around 30 minutes or 200 clicks, whichever comes first. Samsung submitted this patent application in 2017 and it was only officially approved and published yesterday, so we don’t expect to see this new stylus at the company’s next big product event on February 2o. We may never see it at all. But we have to give it props for being a pretty good idea. Samsung’s New TV Tech Is Mind-Bending But Why?